So I've been missing my little memory card reader for about a week. I looked all over for it, but apparently it's just gone. I hate the way things disappear in this house and are never seen again. Like my Halloween candy dish that says "Eek" or my flat black shoes or my black cardigan that I like to wear with everything. Anyway, I just decided to pop the $15 and get a new one so I can actually transfer pix to my computer. Wasteful, I know. But I guess you have to decide how much peace of mind is worth. Here's what I've been doing lately. Thanksgiving went well. 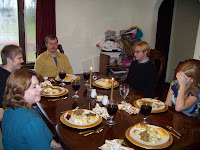 I did the whole turkey thing, as usual. See how happy everyone is that I'm making them wait while T takes a picture? 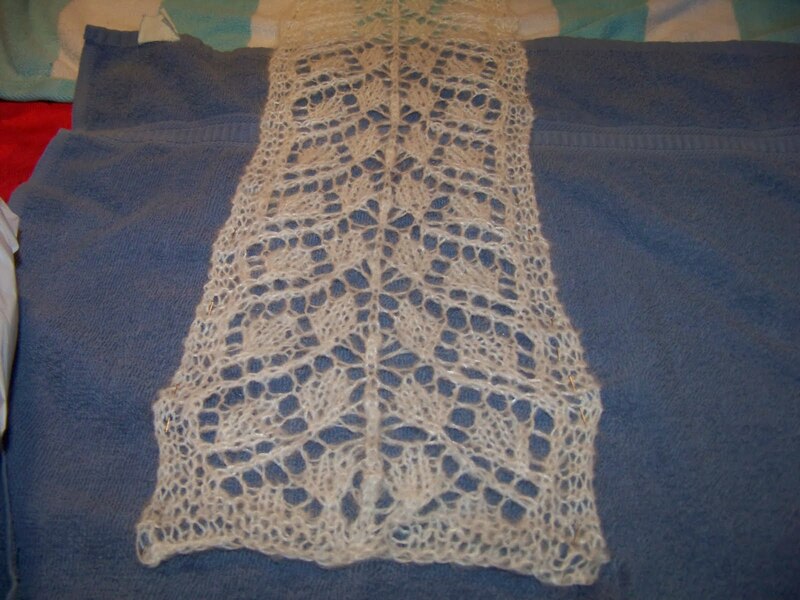 I also finished the Branching Out scarf for JB. It's blocking now. And jeez do I hate blocking stuff. I hate the spraying and pinning and waiting. Actually, you know I'm not a fan of finishing in general, so this shouldn't come as a surprise. Wouldn't it be nice if things just came off the needles fully loaded and ready to go? Anyway, JB has had a rough year, with branches closing and having to let people go. I can see on her face that these things affect her personally. So, I wanted to give her something for Christmas this year that really says "I'm thinking of you." 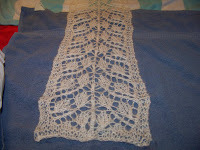 The lace pattern goes pretty quickly--or would go quickly, if the yarn weren't so hairy. 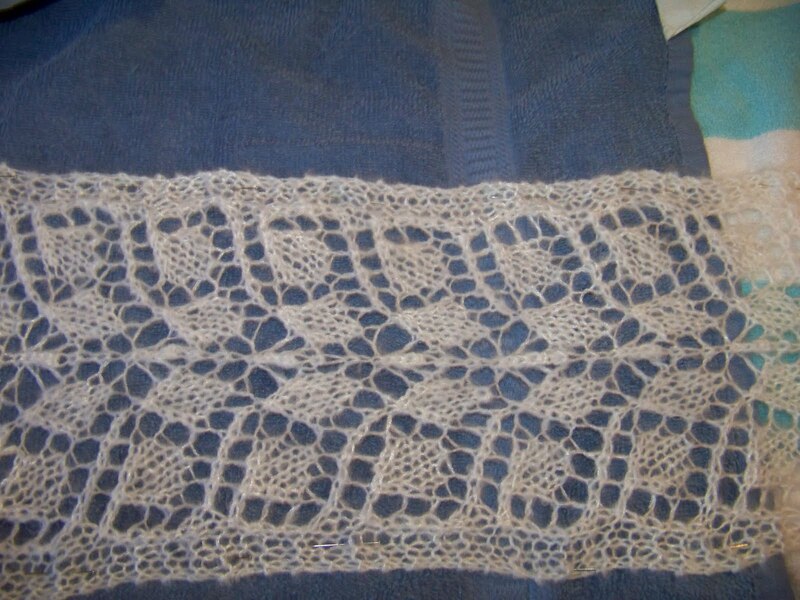 I used Patons Lacette in White Whisper. It only took one skein on size 6 needles. I think it looks very luxe. Hopefully JB will like it too. And so he says, 'I don't like the cut of your jib.' And I go I says, IT'S THE ONLY JIB I GOT, BABY! I say he's in there. It's our Breast Cancer Awareness Day at work, so we are all "passionately pink for the cure." I think we look a little like back up singers for the musical, Grease. "And, isn’t sanity really just a one-trick pony anyway? I mean all you get is one trick, rational thinking, but when you’re good and crazy, oooh, oooh, oooh, the sky's the limit!" A while back, I bought this beautiful hand-painted cotton chenille on eBay. Normally I avoid chenille, because while I love the way it looks and feels, I do not enjoy the frustration of knitting with it. But I was overwhelmed by the vibrant colors and had to have it anyway. So, it’s been in my stash for about a year, waiting for something to showcase its color. 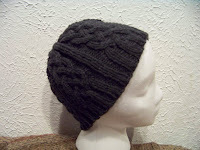 Then I found this Lacey Cantata Hat pattern on Ravelry. 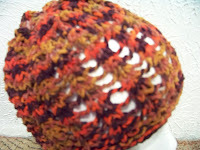 Yeah, I know, chenille doesn’t have any stretch, so maybe hat was not the best choice for this yarn. But, it’s a lace hat, so it’s really just for looks anyway. I think it fits well enough. It took less than half this skein. 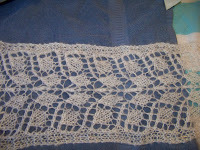 I liked the pattern, so I adapted this same ribbed lace pattern to a scarf, to finish off the skein. And look! What a great looking set this is! This may end up as a gift, but right now I am leaning toward keeping it for myself. This took about 2.75 skeins and about 4 nights to knit. This is the second or third thing I’ve done with a prominent seed stitch section lately. I guess I’m just loving the seed stitch. It really is a cool pattern, though. 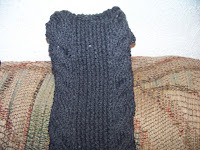 Only knit and purl stitches, and so much texture! Looks good for guys or girls. I like broken rib for that reason, too. Whoa! How Is It November Already? Doesn’t it seem like the year just whizzed by? Granted, the 34 degree temperature when I left the house this morning was a subtle clue that it was fall, but I just don’t feel like it should be November yet. I mean, I still have stuff to do before it’s the holiday season. Why does the last part of the year fly by? It seems like January takes forever, with the snow and grey sky and ridiculously cold air. And April. April is cold and wet and muddy. April lasts. But sheesh! October to December lasts about 2 heartbeats. 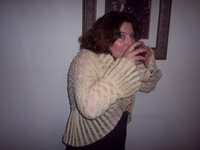 Anyway, I am feeling good about the Christmas knitting. 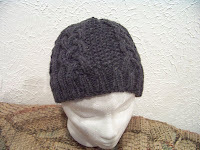 Finished this Cabled Hat for someone (not mentioning any names, just in case). 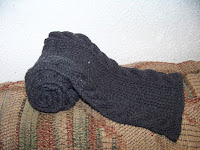 It’s done in Bernat Cashmere, which is a very soft, yet thick-feeling blend of acryllic and cashmere. The color is Coal, which is just about my favorite color for men’s accessories. 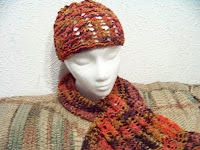 This hat, with all its cabley goodness, took about 1.25 skeins. It took a while to knit, too. Maybe I’m getting old distracted or something, but for some reason, I just could not memorize this cable pattern and had to keep looking at the chart. And every time I looked at the chart, I would think Oh that makes sense. I didn’t need to look at the chart. Sigh. A mind is a terrible thing to waste. Friends Don't Let Friends... uh... Release Giant Snakes? I’m sorry. I really thought this was common sense. If you have an animal that doesn’t belong in that ecosystem, don’t release it into the ecosystem. No, what I really want to talk about is the absurdly evil nature of the people who do this. Now, everyone in the US has seen a movie that starts out with somebody, either accidentally or on purpose, releasing (or letting escape) a non-native species into the unsuspecting ecosystem. 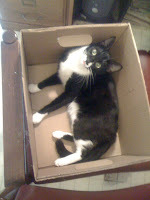 There are no natural predators and the thing runs rampant, eating pets, livestock, birds, and fish. And then they just get worse, until people are being eaten by the thing. And nobody will be able to do anything about it. Not until Lorenzo Lamas or Lou Diamond Philips (or, God help us, Debbie Gibson) shows up, at least. And even then, the body count is going to get ridiculous. Oh, and don’t go making out in the woods. That always makes you the first target of any monster in any movie.